***yick~yack~yakkity~yack***: When TiTy Talks About da Panda! When TiTy Talks About da Panda! 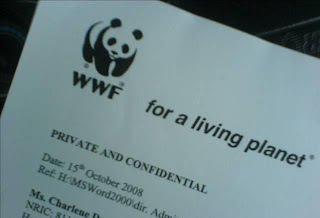 I went to the WWF-Malaysia office today at CP Tower to get all my documents, filling up some forms and short briefing by da Senior Manager. Guess wat! I'll be working under a lady boss this time (HuHuHu). And I think she's a very detailed person (die la me!) hahaha. I'll be assisting my bos who is da Senior Manager, Programme Development for Sabah, Malaysia. This Sunday I'm off to PJ for training, together with a few WWF-Malaysia Staff. Bagus ni diorg at least they're staff of WWF-Msia odi, they hv da background of wat da organisation is all abt. An added advantage for them for da training. sa first day keja suda kana suru out-station. hentam ja lah! ekeke.. I was introduced to Siew Fong today. she'll be in-charge in taking care of da group that will be attending the Training. We'll be staying in Cititel Midvalley (mph here i come!) haha. I'll be there till next thursday evening while da rest balik using da morning flight. sa kena suru stay back for dunno wat... it's an instruction by my bos. I hope i can complete my training with flying colours (chewah! ); Meet shasha for makan2 & jalan2 in KL; & also meet some old frens Zura & Yana... Zura invited me to watch zoom-in with Sheila Majid & her office is located arnd MV..